A mixture of herbs, either fresh or dried, that are placed into savory foods as they cook to enhance the flavor of the foods being prepared. Typically, a variety of parsley, bay leaves, thyme, marjoram, and peppercorns are selected to be combined as the ingredients for the Bouquet Garni mixture. Herbs should be selected that complement each other and the food being cooked. 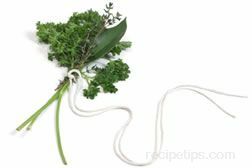 A Bouquet Garni may be made from either fresh ingredients tied together or dried ingredients mixed and placed in cheescloth tied into a bag for dipping into the soup, stew, sauces, casseroles, or meat dishes. When fresh ingredients are chosen, a common selection may include several sprigs of parsley, a single bay leaf and a sprig of thyme, all tied together with a piece of string that can be used to place the garni into a steaming pot. When dried ingredients are used there are several ways that the selected seasonings can be contained for placing into the pot. A cheescloth bag can be created from a square piece of cheesecloth material by bringing all the corners together so they can be tied to form an enclosed bag. Or a pre-made bag can be purchased that has been constructed for the purpose of making a Bouquet Garni. A third alternative is to make or purchase a pre-assembled array of herbs that are wrapped in a bay leaf or some other type of dried wrap, which in Spain is referred to as a Farcellet. Some of the common dried herbs for a Farcellet include winter savory, oregano, and thyme wrapped within a bay leaf and hand tied with string to form a satchel of herbs. In addition to hand making a Bouquet Garni, other options available include manufactured garni bags that are similar to tea bags containing pre-selected herbal ingredients sealed in paper steeping bags. Many of the manufactured Garni are made with ingredients that go well to season specific foods, such as meats, poultry, game, and fish. 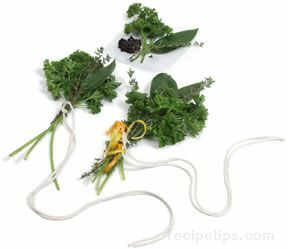 When making a Bouquet Garni, vary the size of the bag and ingredients so they both are sufficient to season the volume of the food being prepared, so it is not to weak to enhance the flavor nor overpowering to the other flavors being complemented. After steeping in the food being cooked, the fresh or bagged Garni is removed before serving the dish. Some of the various foods where Bouquet Garni is used may include soups, stews, rice or vegetable dishes, meats, poultry, wild game, fish, and shellfish. There are other types of containers commonly used to hold the Bouquet Garni herbs such as herb balls or tea balls, made of reusable stainless steel. The dried ingredients are chopped into smaller pieces and placed into the balls which have perforated holes so the cooking liquids can pass across the herbs as the food is cooking.